What Does Matthew 28:7 Mean? "Go quickly and tell His disciples that He has risen from the dead; and behold, He is going ahead of you into Galilee, there you will see Him; behold, I have told you." The tsunami of events that had taken place over the previous week must have left the disciples shocked and confused. Only a few days earlier, Jesus had ridden into Jerusalem on a donkey, where He was hailed as the Messiah, Who had come in the name of the Lord - as palm branches were strewn in His path. However, the euphoria they witnessed capsized into a sequence of catastrophic events, which resulted in illegitimate trials; an unlawful sentence; Christ's cruel crucifixion; a series of violent earthquakes; various unexplainable convulsions of nature and the veil of the Temple being torn in two - from top to bottom. The devastated disciples discharged their Sabbath day duties, while the Jewish rulers scurried about making sure that Christ's tomb was securely sealed and guards assigned to prevent any unauthorised attempt to enter; break the seals; remove the stone or take away His body. At the earliest possible moment, however, "as it began to dawn, toward the first day of the week", we find Mary Magdalene and the other Mary coming to look at the grave. These faithful women witnessed an angel of the Lord descend from heaven, in the midst of a severe earthquake. They watched him roll away the stone from the tomb - and sit on it! His appearance was like lightning to them, and his clothing was white as snow. God overruled the nefarious plans of man causing the guards to shake with fear of this heavenly being, and they fainted or had a stroke. 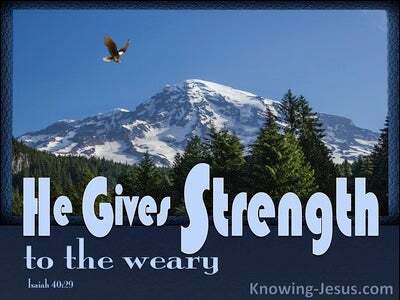 However, the women were reassured by his comforting words - "FEAR NOT". He then told them that Jesus, Who was crucified was not there but risen from the dead. Indescribable joy must have flooded their torn hearts as the messenger instructed them -"Go quickly. 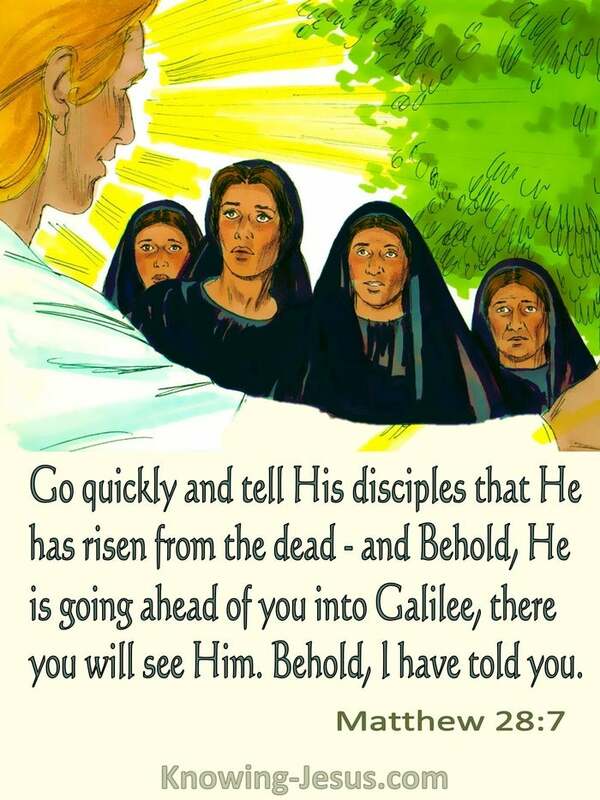 Tell His disciples that JESUS is alive and has risen from the dead - and behold, He is going ahead of you into Galilee. 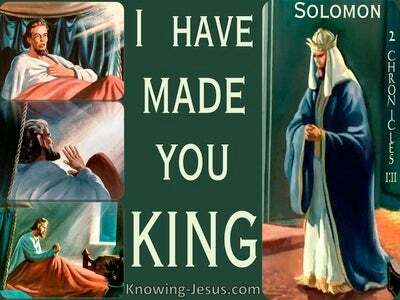 There you will see Him - Behold, I have told you." The women, were charged by this angelic messenger to go to His disciples with utmost speed. They were to proclaim the good news that Christ is risen from the dead. They were given the disciples an important and specific directive. It was not a holy angel, but a few excitable women who were to instruct the disciples to go to Galilee and that Jesus was going to go ahead of them - and they would see Him their. The women received an important, God-given directive, and were finally charged - "Behold, I have told you!" This should not have surprised the women nor the men, for Christ had forewarned them on many occasions that He would be handed over to the Gentiles by the Jewish rulers - that He would be crucified and rise again on the third day. The circumstances of the day; the emotions of the heart; the imagination of the mind and a lack of faith caused these followers of Christ to have a selective memory of His Word. They mourned over His death, instead of waiting expectantly for His resurrection on the third day - as they had been told. 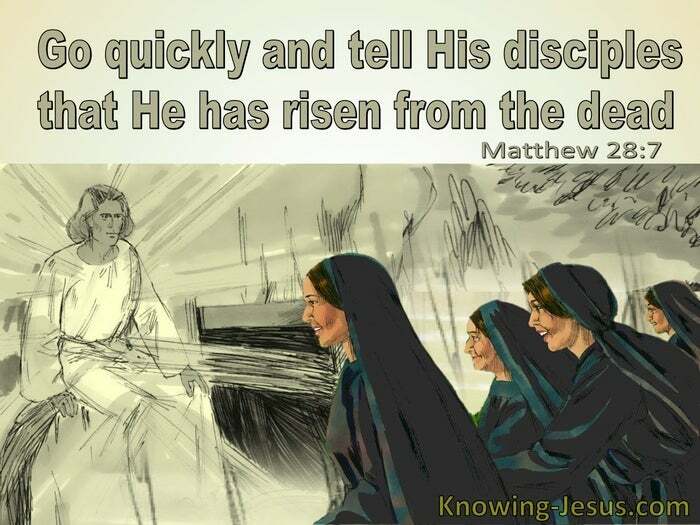 However, when they saw the messenger, the women obediently obeyed the angelic instruction and ran quickly to tell the disciples the good news. 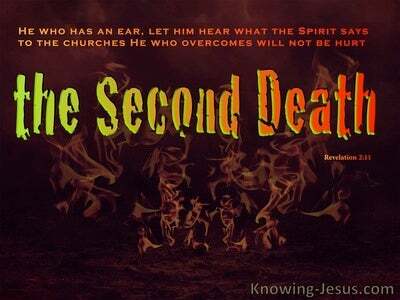 The disciples obeyed these instructions and later they remembered that Jesus had informed them of all these things - prior to His death, burial and resurrection. Like the weeping women and the distraught disciples we too are prone to look at life's difficulties instead of looking to JESUS. We are predisposed to allow emotions and imagination rule our heart rather than standing on the truth of God's unchangeable and inerrant WORD. But like the women and the men in Matthew's narrative, we are not to camp on our preconceived notions or the tempestuous times in which we live. We are to live by faith and not by sight. We are to trust God's word even though the storms of life are beating down on us. We are to know His word; obey His commands; trust His promises and remember all He has taught us over the years, so we will not be deceived with doubt or moved by circumstances. Heavenly Father, what an astonishing lesson to learn from the wonderful story of the resurrection, where the tears of the women and the doubts of Christ's disciples caused them to forget the truth of Your Word and the glorious gospel of Christ - His sacrifice for sin and His victory over death. I pray that I will not allow the emotions of my heart, the imaginations of my mind and the difficulties of life's circumstances to eclipse the truth of Your word; or overshadow the many precious promises that are ours, by faith in Him. May I stand on the truth of Scripture; obey Your commands; trust Your promises and never forget that Your Word is steadfast; sure; living; powerful; sharper than any double-edged sword and cannot be broken. 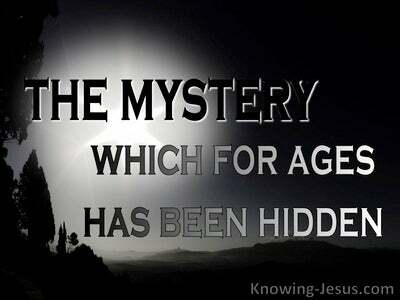 I pray that with every passing day I would stand fast on its truth and not be shaken - this I ask in Jesus' name, AMEN.